All fork trucks come with 100% piece of mind six month warranties All fork trucks come with a Report of Thorough Examination. Column Direct Shift Power Steering Suspension Seat Battery Fuel Guage Hour Meter. Never heard of us before? Then you've been purchasing your Fork Trucks from all the wrong places! Always at your service' is our ethos. From humble beginnings we've transformed into a multi-million pound business. It's really quite simple. Our criteria for selecting the products we sell is as simple as our success story. After all, he who has the cheapest prices truly knows the value of his goods! We also know that providing customers with the complete package in terms of preparation standards and after sales service is what really matters in our market and it's not just about being the cheapest. Several reasons why we're the UK's favourite online Fork Truck store. All fork trucks come with 100% piece of mind six month warranties. All of our used equipment undergoes a 72 point inspection and an operational test by a qualified technician, with the subsequent rectification of any faults found. A routine service is carried out prior to sale. All fork trucks come with an independent CFTS (Consolidated Fork Truck Services) Report of Thorough Examination (the fork truck equivalent of an MOT certificate). Free fork truck operator familiarisation training. Free fork truck daily/weekly/monthly operator maintenance training. All fork trucks are delivered on our own purpose built transporter. We hold over 150 Fork Trucks in stock. All of our approved used fork trucks undergo thorough preparation to make them of the highest possible standard. Fork Trucks Online's promise to you. If you are local to us our technicians have fully equipped mobile workshops, including the latest diagnostic technology, and will deal with your repairs as a matter of priority. Whist the processes we go through to prepare an approved fork truck at Fork Trucks Online are exhaustive and well proven to minimise the likelihood of failure, as with all things mechanical, from time to time problems can occur. We see this as our opportunity to shine. Modern equipment depends increasingly on electronic diagnostic tools - we make sure we have the latest equipment at our disposal. Our factory trained technicians in their mobile workshops will attend to any faults as a matter of urgency. Our One-Stop shop - throughout your ownership any servicing or repair requirements can be dealt with at Fork Trucks Online. Many companies come to us looking for specific equipment. If we don't have the equipment in stock which suits your needs - leave it to us to find it! Every day we are offered equipment which is not advertised on the open market. A number of dealers may offer this service but we are prepared to approach the matter differently and be as proactive or relaxed in the search as you wish. 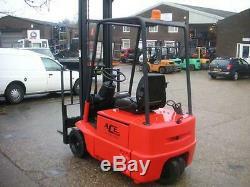 Do you have a Fork Truck that you wish to sell? Do you want to sell to an honest and upfront company that always put their clients' needs first? We own the stock that we sell and will pay you in cleared funds for your excess or redundant equipment. The item "Linde E15 1500kg Electric Forktruck Fork Truck Forklift Fork Lift" is in sale since Monday, October 27, 2014. This item is in the category "Business, Office & Industrial\Material Handling\Warehouse Loading & Unloading\Warehouse Forklifts & Stackers". The seller is "forktrucksonline" and is located in Rugby. This item can't be shipped, the buyer must pick up the item.